Ohio furniture stores have nothing on us when it comes to being the best. Whether you have a love for Amish furniture or just need stunning, quality pieces for your home at a super competitive price, we’re the perfect choice. We get shoppers from all over Northeast Ohio as well as the rest of the country at our furniture store Columbus Ohio. Wide variety of pieces to choose from for every room on the house. Yes, this includes your beautiful outdoor living space. The best in quality pieces. What you find here is different than other Ohio furniture stores. Using only the finest kiln dried American hardwoods, the furniture here is built to last for generations to come. The fairest and most competitive prices around. Get better deals here on what we have for top quality furniture than what other “discount” stores offer for disposable pieces that may not last you to the next year. Amazing customer service. We don’t just sell furniture; we offer our customers the best furniture shopping experience around. Get all of your questions answered and make the choices that best suit your individual needs by working with our expert staff. What Goes into the Process? 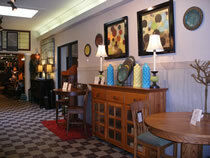 If you have never shopped at Amish Ohio furniture stores, you may not yet be familiar with what goes into the process. This means you don’t already know about the amazing tradition behind Amish furniture making. To start with we work with more than 70 families in and around the Northeast Ohio Amish communities to get you furniture created. When you shop with us, it means your pieces are built to order. You have choices to make as far as the type of wood or stain used so that your pieces are customized to your desires. Sometimes multiple generations of the same Amish family work together to create your special order. The skills that goes into hand building each piece means also every detail is done by hand, right down to the dovetailing. You can also feel good about the process being environmentally safe from start to finish. Aside from meeting the EPA requirements, there are many other details of Amish furniture building that make this the “green” choice to make. The best way to understand how amazing the process of Amish furniture is starts by stopping by our Westerville showroom to take a look for yourself. Meet our staff, browse our collection and ask any questions you may have. You will quickly come to understand how Amish Originals Furniture Co. is more than just another one of the Ohio furniture stores around. Take a new look at our selection and see just how much we have to offer for your home, inside and out.